The Bootstrapper’s Guide to the Mobile Web includes no extraneous text. It’s a practical guide served straight up, an indispensible toolbox crammed with no-nonsense methods and practices for getting your website mobile. The motivational infomercial riffs one often finds in books of this type are thankfully absent. The author often directs you to her site and resources; however, this is a given for books of this ilk, and when Deltina Hay references her online resources, they are directly relevant and add to what one reads in her book—again without unnecessary frills. Just how timely is this book really? By 2013 at latest, more Internet surfing will occur on mobile devices than on laptops and desktops. Ms. Hay makes clear that for any website owner, it’s not a question of whether you need a mobile website or an app—it’s whether you need both. Mobile device users will soon dominate social networking, proliferating what they find of value on your site far more than those using yesterday’s technology (laptops and desktops). Mobile website? Mobile app? Native app? For any mobile developer, these terms are crystal clear. Most others will at best have but a vague sense of the precise differences—if that. 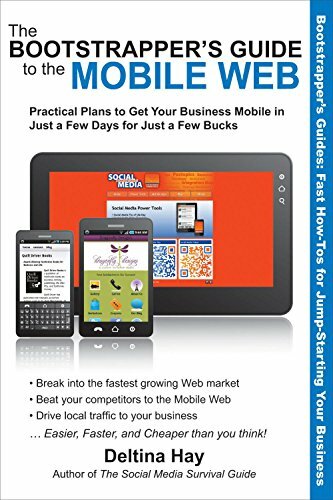 Regardless, for any website owner or developer less than 100% expert in mobile website and app development as well as the many resources available to build and promote online mobile presence, The Bootstrapper’s Guide to the Mobile Web is an unintimidating go-to resource. Even for those who are overwhelmed when looking at a few lines of code, the book will enable the building of a mobile roadmap. Readers with varied levels of tech knowledge will encounter lucid, easily followed descriptions of the information and tools to plan a mobile strategy for an Internet that is still an everchanging and evolving Wild West. Like most of the books in this general space the author—yet far less frequently than many—occasionally assumes a tad too much tech intuition for those who need to be told to keep breathing between directives from tech phone support. But this is a trifle. Untrained site builders with tech aptitude will find a mother lode of DIY instructions. If contemplating a mobile self-build of any sort causes a breakout of hives, this volume will present you with options for entirely outsourcing mobile development, detailing the tradeoffs between various choices. Indeed, some non-tech-savvy readers will likely find themselves better versed in such areas as mobile index listings critical to maximize visibility, protocols for registering apps, advertising resources to both promote your mobile presence as well as monetize it, etc., than those to whom they outsource development. The price of The Bootstrapper’s Guide to the Mobile Web is a fraction of an hour of tech development—invariably money well spent. Fifteen minutes of development time saved recoups investment in this book. Read armed with a highlighter and a notepad (the latter only if you e-read or don’t have a digital notepad) to compile a list of resources and page references most relevant to your build. Bottom line: If you have learned how to optimize your traditional desktop and notebook presence, then we applaud you; few have. But when you go mobile, as you absolutely must, there is an entirely new universe of techniques that must be considered. Because, yes: Knowing the new approaches to search optimization and other issues is critical—or your site will soon become an anachronism.